We all have that one stretch of wall that needs a little something to fill it. 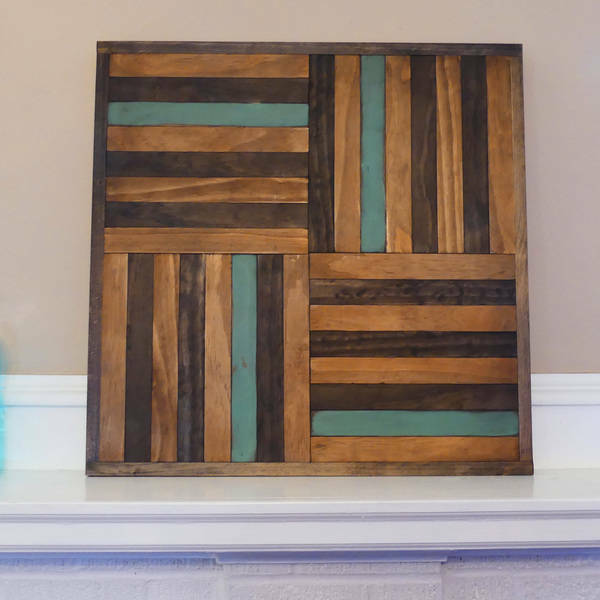 Look no further with this simple & stylish Wooden Wall Art project! Measure and cut 34 pieces of 1”x 2” to 12” each on a miter saw. Use sandpaper to smooth out any frayed edges. Check the cuts to make sure they are all the same length. Trim any pieces that are slightly longer. Lightly sand the top of each piece of cut 1” x 2” x 12 with 220 grit sandpaper. Factory cut lumber has a thin coating that can hinder stain application. Don’t over sand the pieces or round the edges. Stain and paint the tops of the 1” x 2” x 12” pieces. 16 are stained a lighter color. 12 are stained a darker color. 4 are painted with leftover paint. Wipe off any excess stain and allow to dry for the recommended time. Lightly sand the surface of the 4 painted 1” x 2” x 12” pieces. Sand around the edges to expose the wood underneath. Be careful not to round the edges when lightly sanding off the painted areas. Draw a grid guide on the 24” x 24” sheet of plywood making four equal 12” x 12” squares for the pattern. Apply wood glue on the plywood sheet on only the grid section being worked on at that time. Start at the outside edge with the first piece of 1” x 2” x 12” and work inward. Apply a small amount of wood glue on the inside edge of each piece to adhere to the next piece placed. A 30-minute wood adhesive was used instead of normal wood glue because it allows slight adjustments for up to 30 minutes. A little glue goes a long way. Once all pieces have been placed and the wood glue has dried, apply the darker stain color over the entire piece. Wipe off the excess stain and allow to dry. This will “antique” the painted pieces and highlight the sanded edges. Measure the width across the piece (it should be 24”) then cut two pieces of 1”x2” to 24” for the frame. 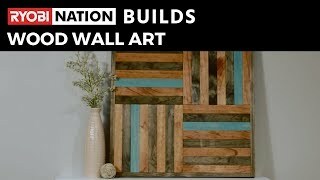 Lightly sand the edges with 220 grit sandpaper and then attach to the edge of the wall art with wood glue and brad nails. Repeat step on the opposite side with the other 24” piece of 1”x 2”. Measure the remaining two edges for the frame (it should be 25.50”). Cut and lightly sand the two pieces and attach with wood glue and brad nails to complete the frame. If the frame pieces are a little longer than needed they can be sanded down. Any gaps can be filled with stainable wood filler with the excess sanded off after it dries. 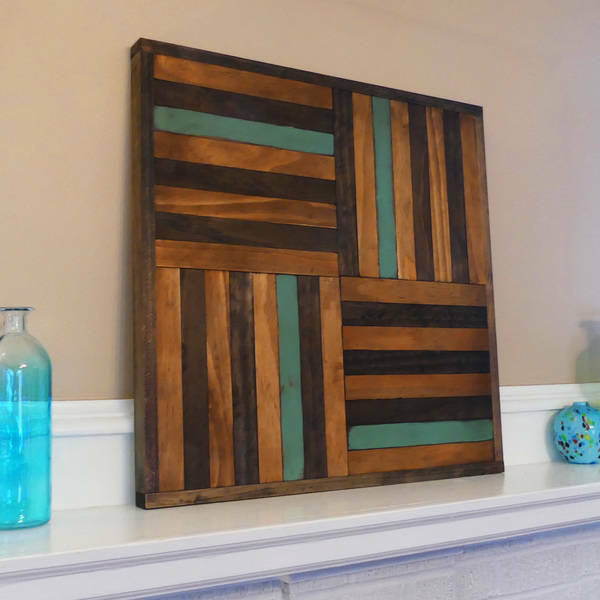 Stain the frame with the darker wood stain. Wipe off the excess and allow to dry. It’s okay if stain gets on the pattern, just wipe off the excess and allow to dry. Add picture hanging hardware on the back and display!